Floor standing hose coiling machine. Will coil hose and larger diameter tubing sets and single pieces of plastic and rubber tubing. Ergonomic design has tilted work surface for easy handling of hose product. Automatic counter for number of turns, heavy duty mandrills retract for removing hose and tubing easily. The heavy duty hose coiler is used for coiling hose and thick wall large medical grade plastic tubing. This coiling machine increases production output and also prevent carpal tunnel syndrome injuries. Cut to length hosing or medical tubing is placed on the coiling machine. The turntable on the coiling machine rotates the exact number of turns to complete the coil. After it stops, the mandrels on which the coil was wrapped descend into the coiling machine, enabling the operator to slide the coil into a package. 1. Automatic hose and tubing coiling, the machine counts the number of turns and stops. No need for manual control. No overruns. 2. Completely adjustable mandrel to accommodate many tubing coil diameters. 3. 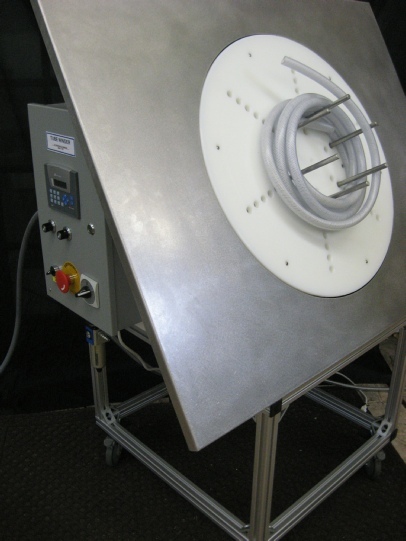 Produces uniform tubing coils each time faster than manual coiling. 4. Packaging fixture enables you to place a pouch or bag on for easy loading of tubing into pouch. 5. All timing and counting functions can be changed easily. PLC controlled and completely programmable. Auto or Jog modes. Pause/Resume button. Please contact us for specifications and pricing information.